A bit over a year ago, my grandma moved into a nursing home. 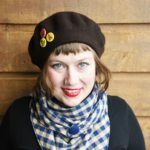 When my mom was facing the difficult task of emptying the apartment my grandparents had lived in for over 30 years, she found my grandma’s berets. I don’t think that I have ever seen my grandma wearing any other hat style. 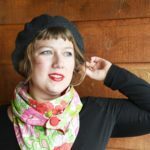 Berets were definitelty her go to nogging ware. 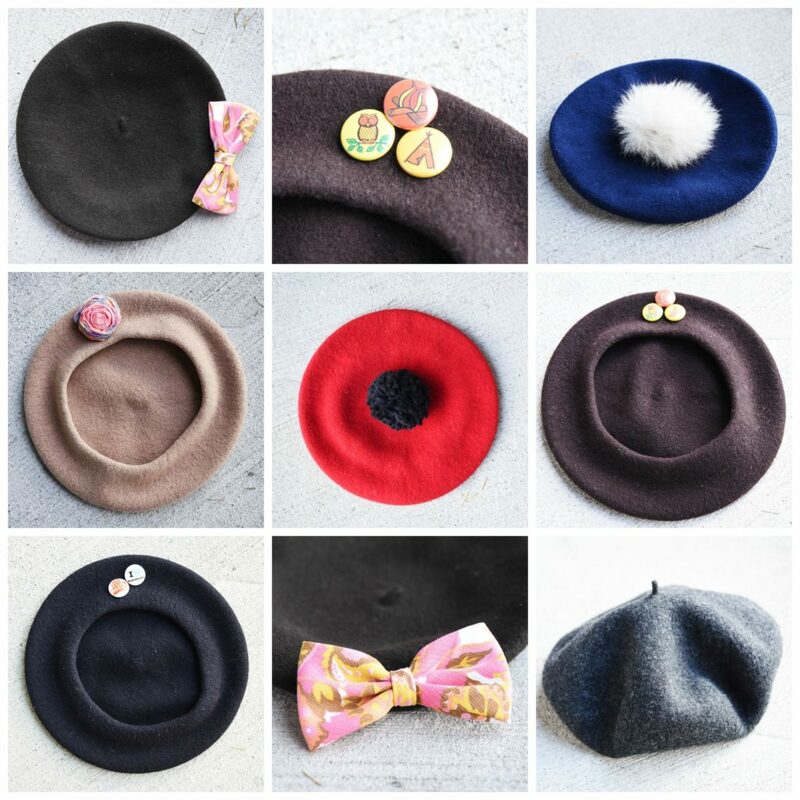 My mom thought that, because of my long-standing obsession with accessories, I would cherish these hats the most. Oh, she was so right! 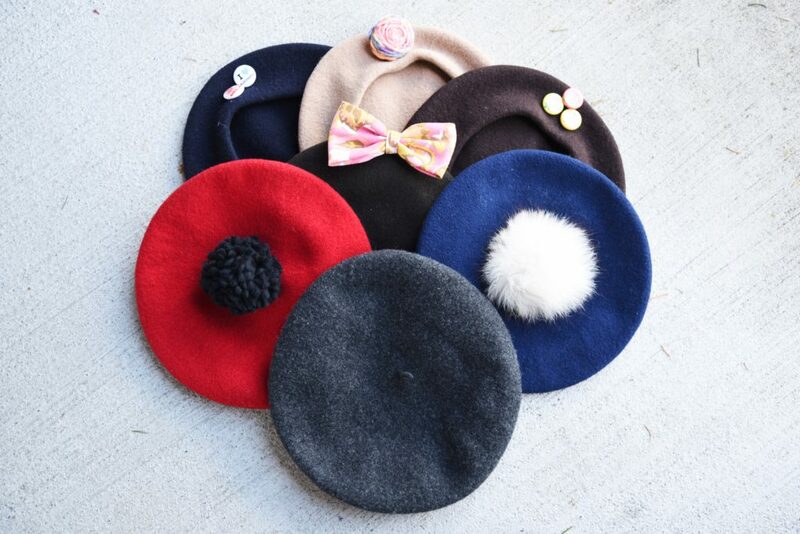 But what to do with 7 berets and all kinds of neutrals and one red one? 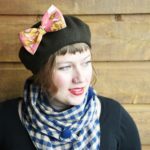 If you have been following this blog or seen my vintage fabric accessory designs, you know that I am not quite into neutral colours. Give me pink, bright blue or red anytime! Well, thinking about it, I do like neutrals when they’re contrasted by a pop of colour. What to do, what to do? Oh, I know! 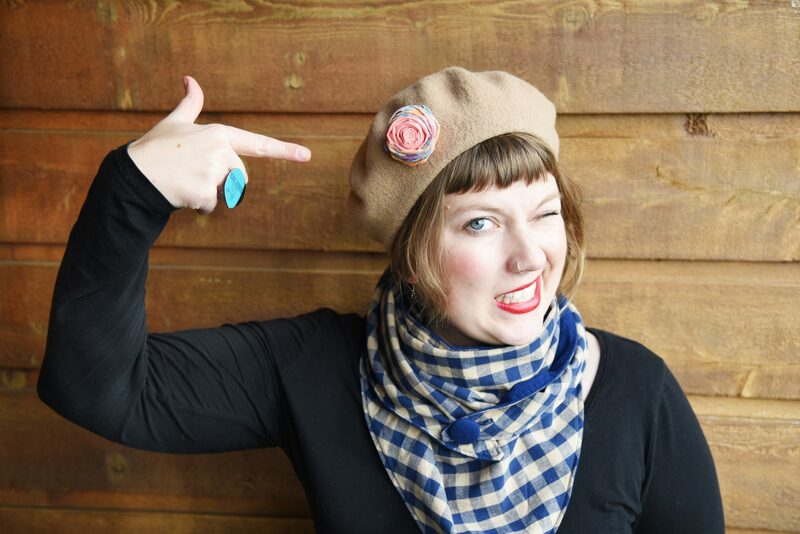 How about up-cycling these berets with a fun add-on? 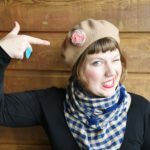 I started out with 7 berets and came up with 5 ways of up-cycling them. I decided to leave one as it was to honour the way my grandma wore these hats. It’s the pretty charcoal grey one in the bottom right corner of this photo collage. 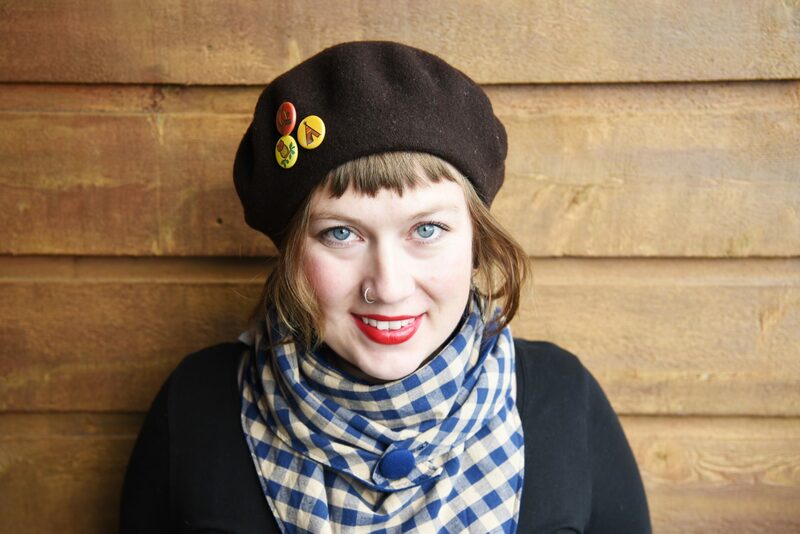 A few Christmasses ago, my super creative sis-in-law made a fur pompom for me from a vintage fur coat. I’ve had that pretty pompom hanging out in my studio for way too long. Finally the right idea! 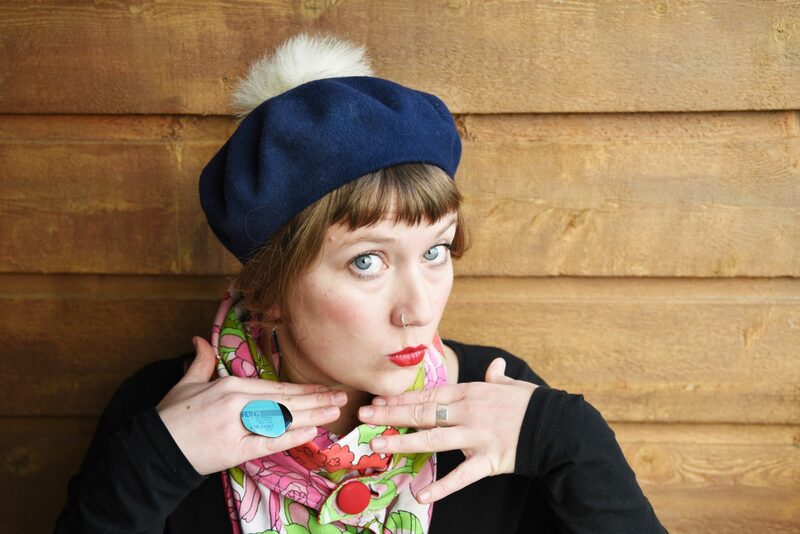 So I just sewed smack in the middle of the navy blue beret. 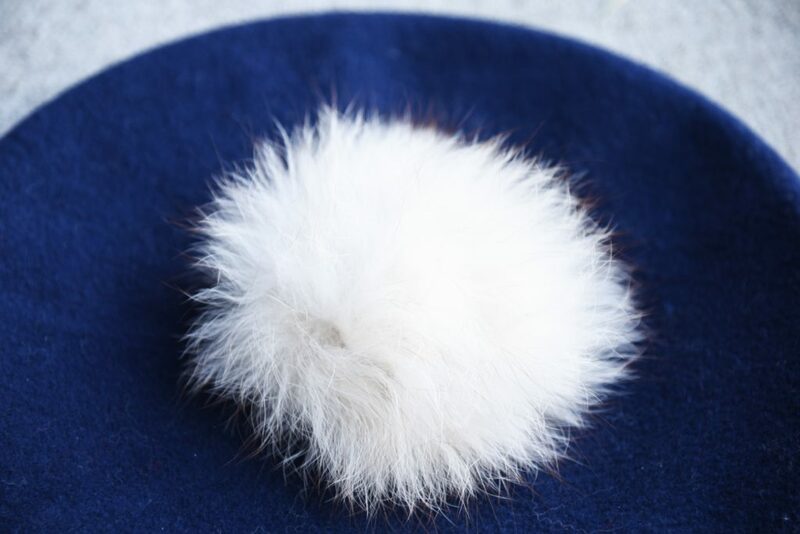 Should you not have a fur pompom just lying around in your creative space, here’s a handy little tutorial! 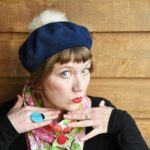 You don’t need to cut up a vintage fur coat, faux fur is a wonderful alternative but just don’t buy new fur, ok? Let’s stay with pompoms for a little while longer. 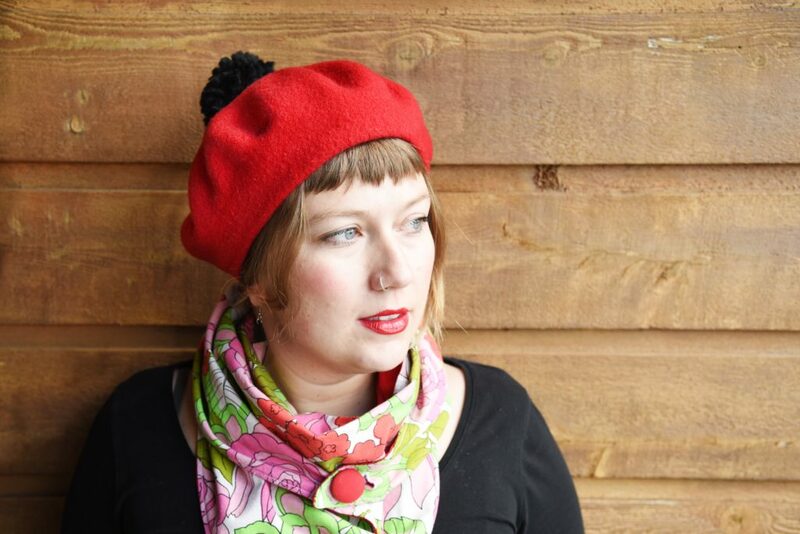 As you can see in the photo of me wearing the red beret above, I attached a black yarn pompom to the red beret. Isn’t it just so French? I feel like I really need to make a trip to Paris in winter, so I can feel Frencher than French. 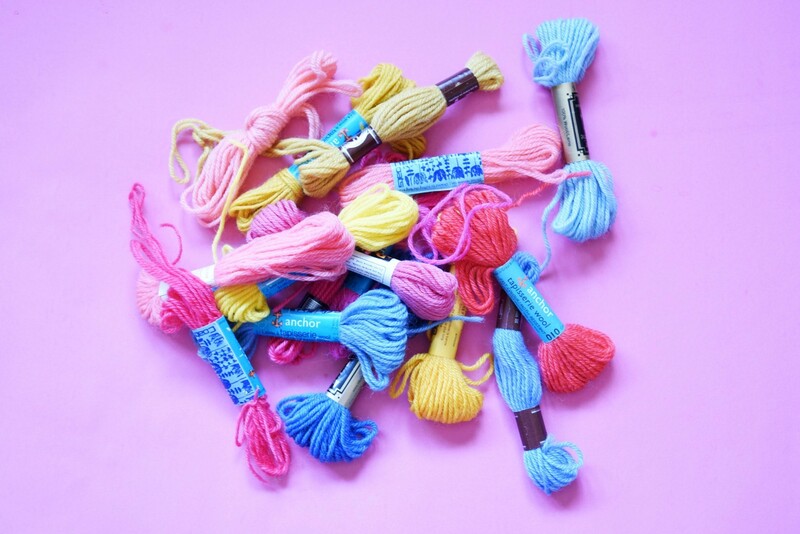 If you don’t know how to make a yarn pompom, it’s time to learn. So easy and so much fun, watch this helpful video to practise! 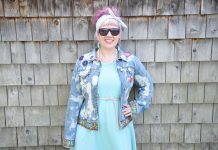 Sometimes I feel like I’m drowning in vintage fabric scraps. While donate some of them to my local thrift store for quilters to have fun with, I keep the prettiest of them. I’ll be using quite a few of them for my spring/summer 2017 collection but I’m happy about any projects I can use them for. 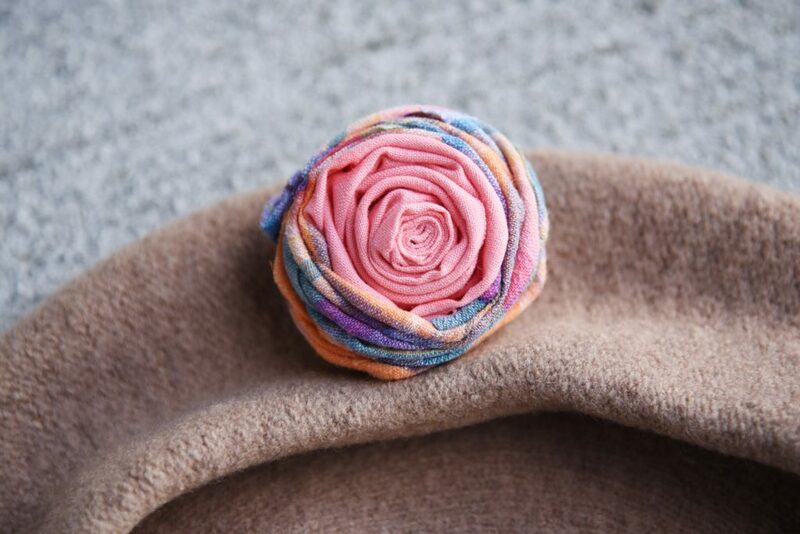 So why not make a gorgeous pink, grey and yellow fabric scrap rose to adorn the beige beret? 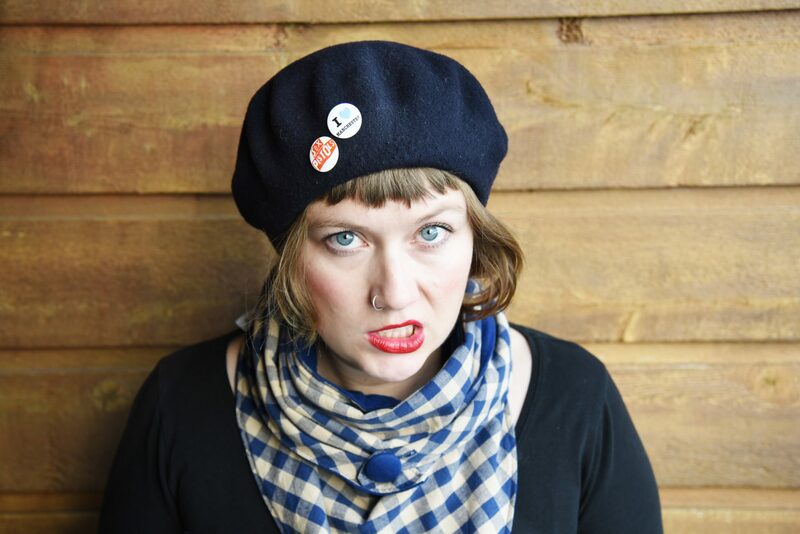 I sewed it onto the brim of the hat, so it looks nicely when I’m wearing it. Here‘s how it’s done. 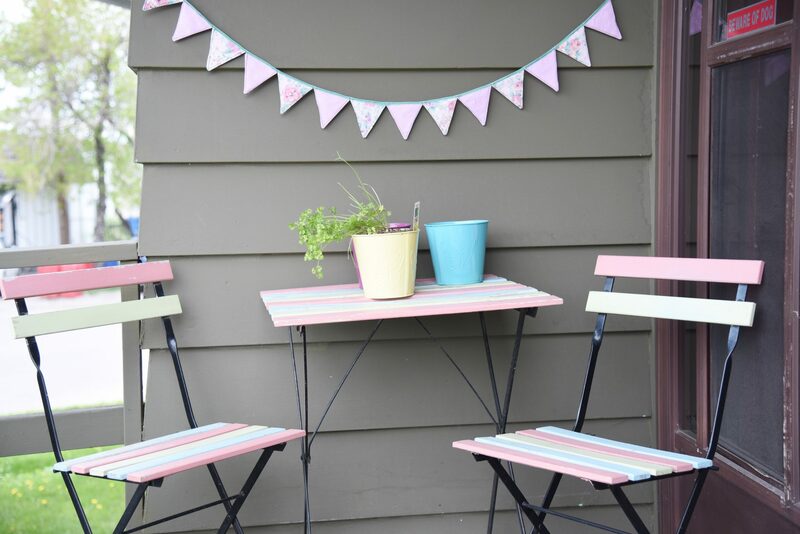 Projects four and five are super easy! A friend brought me these vintage looking punk pins from her trio to England while another friend gave me the cutest camping-themed pins for my birthday. They have been looking cool and pretty on my dresser for the longest time because they didn’t look perfect on my jean jacket. 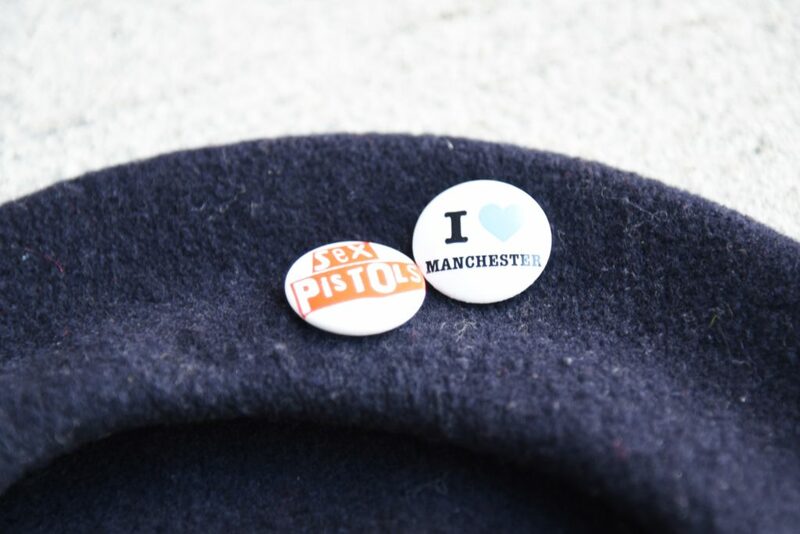 But they were perfect for the dark navy and brown beret. 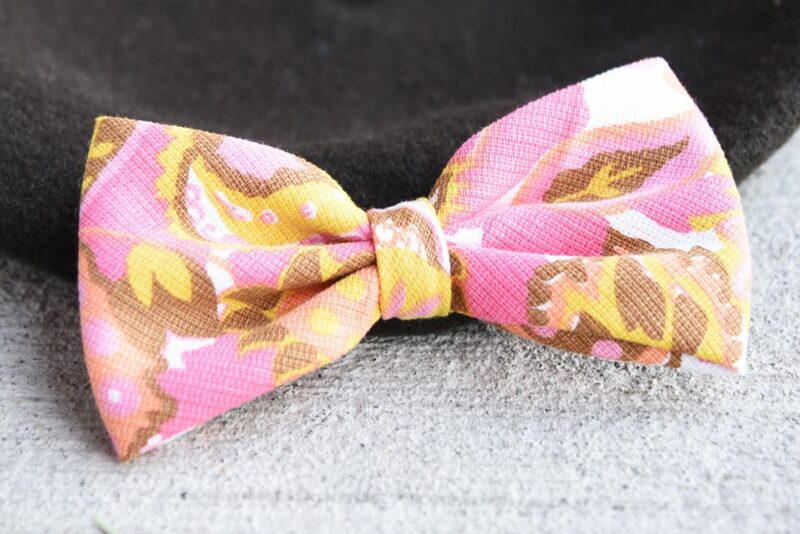 I just love bows, so I just had to make one from my most favourite 60’s barkcloth scrap. This time, I sewed it just on top of the brim for the best positioning. 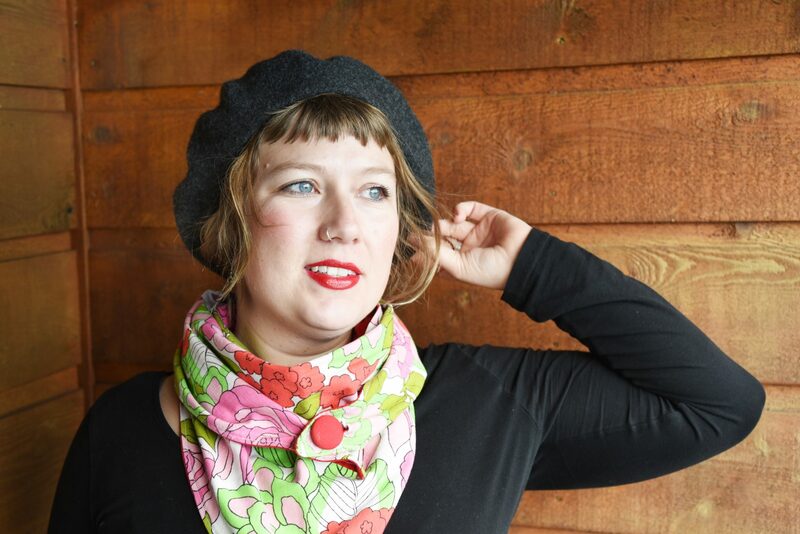 It’s a fairly big bow because I wanted this beret to make a statement. And it does, don’t you think? 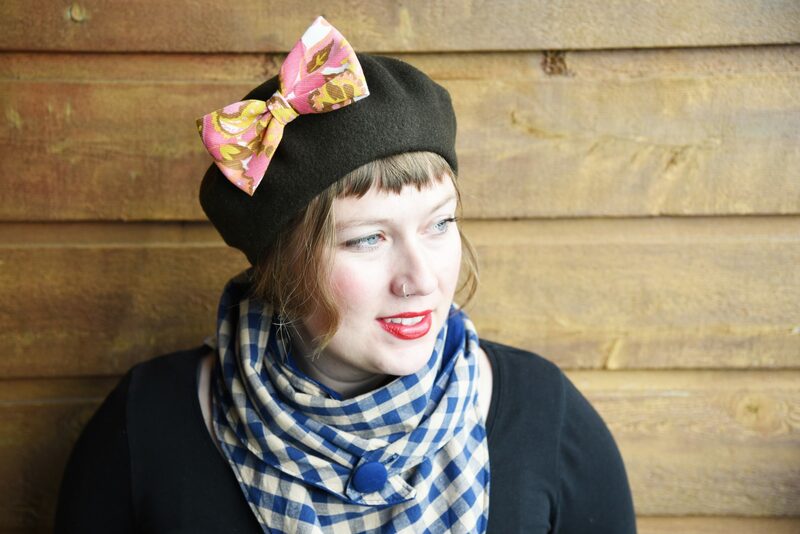 Here’s another little tutorial to show you how to quickly sew a little or big bow! Or rather a big bow? What do you think? 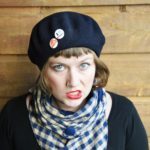 Do you like my grandma’s up-cycled berets? What would you have done with them?